PMD Personal Microderm: Does It Really Work? It's true when they say money can't buy you happiness, but it can buy you a decent at-home skincare gadget! And being the beauty junkie that I am, I jumped at the chance to try the PMD Personal Microderm System*. The celebrity favourite microdermabrasion facial, is simply a mini powerful vacuum that deeply exfoliates to reveal a refreshed and refined complexion. And PMD's award-winning device, promises you can achieve just this in the comfort of your own home. But does it really work? I've had a microdermabrasion treatment previously at my local beauty salon, which cost roughly £40 - getting buffed isn't cheap! So the benchmark of expectation had been set and after three months of good use the results are in. The PMD Personal Microderm System comes with several exfoliating disks for body, face and different skin types and are available for repurchase. Admittedly I was hesitant at first, so I watched the how-to DVD guide and tested the device using the practice disks supplied. Once my skin was thoroughly cleansed I pulled the skin taut with one hand (to ensure the device moves smoothly) and with the other I moved the Personal Microderm in an upward motion keeping the tool moving quickly, making sure not cover the same area more than twice. The treatment isn't painful in the slightest and the device is very gentle. But it's important not to hover over the skin, as you could end up with dark circles, which are a common complication when the device is used incorrectly. Personally I like to feel a beauty treatment working and this device doesn't disappoint! After the treatment I have very slight redness from the suction, which is expected, but it fades quickly leaving my skin baby soft, smoother and instantly brighter. All in all, it's quite miraculous! The PMD Personal Microderm System buffs away the dead and dull top layer of the skin within a matter of minutes reducing the appearance of fine lines, blemishes and enlarged pores. The results are so darn good, I've had to resist the urge to use it more frequently. 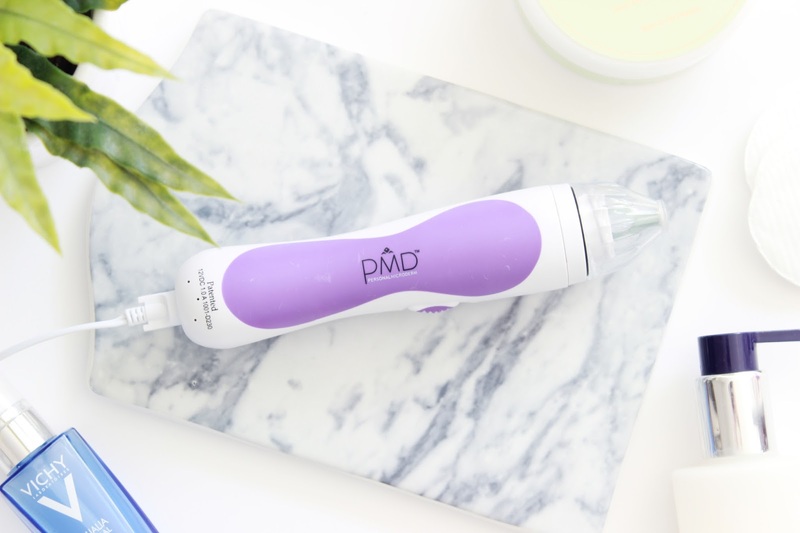 The PMD device is a great investment and effective option at reducing a multitude of skincare concerns and a total game changer if you're in pursuit of a glowing complexion! The PMD Personal Microderm System is available to buy online here for £135. Have you had a microdermabrasion facial, or tried the PMD device?